Boeckeler Instruments, Inc.professional broadcast video marker can increase audience attention by directing it to details on sports, weather, traffic, news, and other broadcast images. The Pointmaker PVI-64 professional broadcast video marker is easy to install and use; technicians or talent can draw and point over prerecorded images during live broadcast or post-production. Choice of 12 different pointers, 3 line thicknesses (with or without a drop shadow or outline), with 7 colors available, 3 colors displayed on screen at any one time. Erase markers at the click of a button. Activate a proximity feature to make the pointer disappear as the pen is removed from the drawing surface. KEY AND PROGRAM OUT. In addition to program out, a key signal can be utilized on all models of the Pointmaker PVI-64 professional broadcast video marker. PREVIEW / PROGRAM CHOICE allows users to display markers on the preview monitor only, or on both the preview and program monitor. TIMING ADJUSTMENTS to counteract video delays can be made from within a menu or from an optional plug-in timing controller, in coarse or fine (pixel) adjustment mode. PLAYBACK allows users to redraw an overlay of markers, either one marker at a time, or all markers at once. You can even adjust playback speed. REMOTE CLEAR OPTION allows the clearing of markers from a location other than where they are drawn. VIDEO PASS-THROUGH. When powered down, the Pointmaker automatically passes the video through without markers. CONTROLLERS. 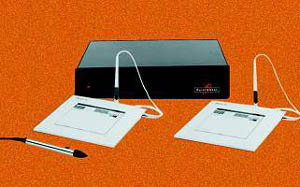 Drawing and pointing is accomplished with a digitizing tablet (PVI-64D). Two tablets may be installed and used at two different news stations. With an optional light pen (PVI-64DL), you can draw and point directly on a monitor. Boeckeler Instruments, Inc.can also be used with certain touch screen monitors. For location work or large studios, built-in line drivers provide options for extended controller cabling. , 4650 S. Butterfield Dr., Tucson, AZ 85714. Phone: 520-745-0001; Fax: 520-745-0004.